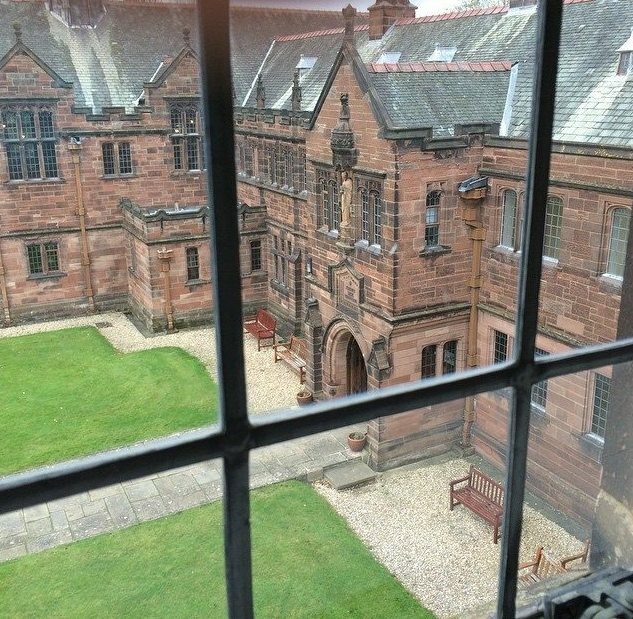 I am into my second week as Writer-in-Residence here at Gladstone’s Library in Hawarden, Wales. You may recall from an earlier post how this two-week adventure all began; if not, you can read about it here. During my time at Gladstone’s I have been immersed in research. 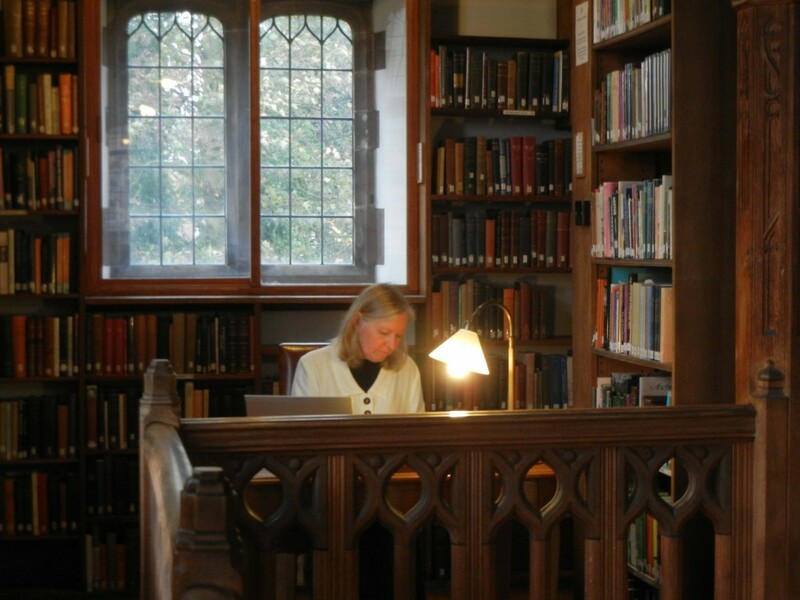 Anyone looking at me in the library would see a 21st century woman seated at a small wooden table, but my mind is somewhere back in the early 11th century, pondering events that were cataclysmic for the heroine of my novels, Emma of Normandy. Although her name rarely appears in the books open before me, my imagination is going at full tilt as I try to fit this young queen into the kaleidoscope of events that took place in the years between 1012 and 1017. 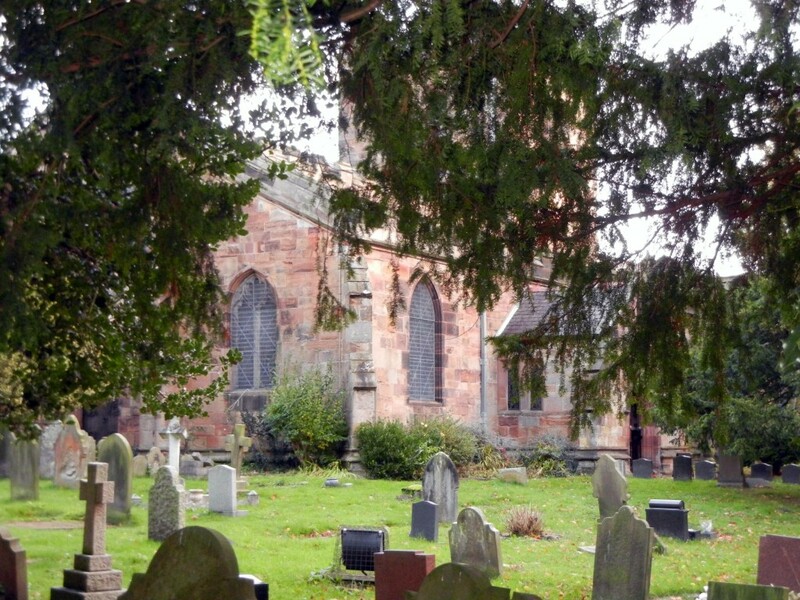 I chatter about it at dinner to complete strangers who make the mistake of asking me what I am doing here; I gnaw over it as I take a walk around the grounds; I contemplate it as I sit in the beautiful little church next door or gaze into the middle distance at Mr. Gladstone’s vast array of books. Slowly, ideas begin to take shape, but I find that I am still rattling around in the historical record. Until I can completely grasp the documented events, I cannot step outside of them to make a story. The history is woven into and around and through the story, but they are separate and distinct; they are not the same. I am close to having a grip on the History. I am only beginning to discover the Story. 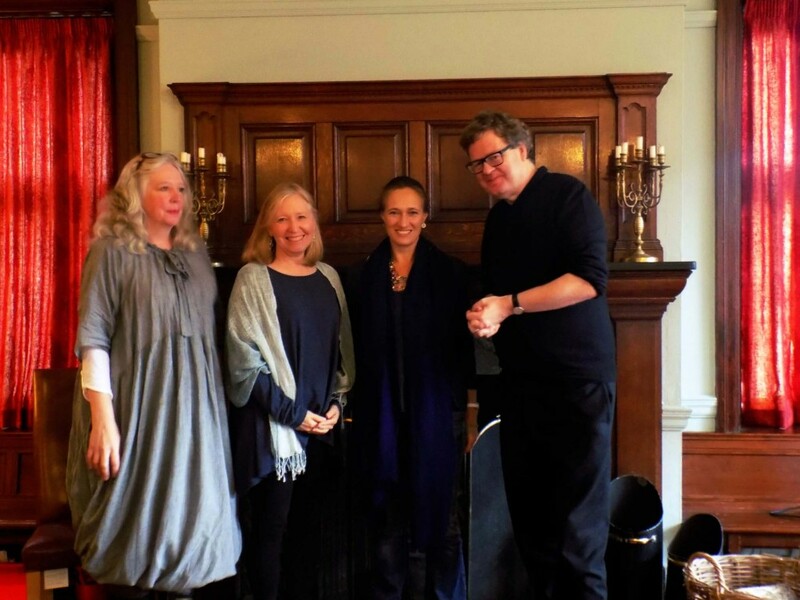 Although much of my time here is solitary, there are many, many opportunities to engage with other writers, with scholars, with travelers and with local folk who stop in for tea. The name of the dining room here is Food For Thought, and it is beautifully apropos because the conversations at table are as delicious as what we eat. And while I’m on the topic of food, let me just say that the chocolate cake at tea time is NOT to be missed. In this room we had to make do with a pretend Hearth. 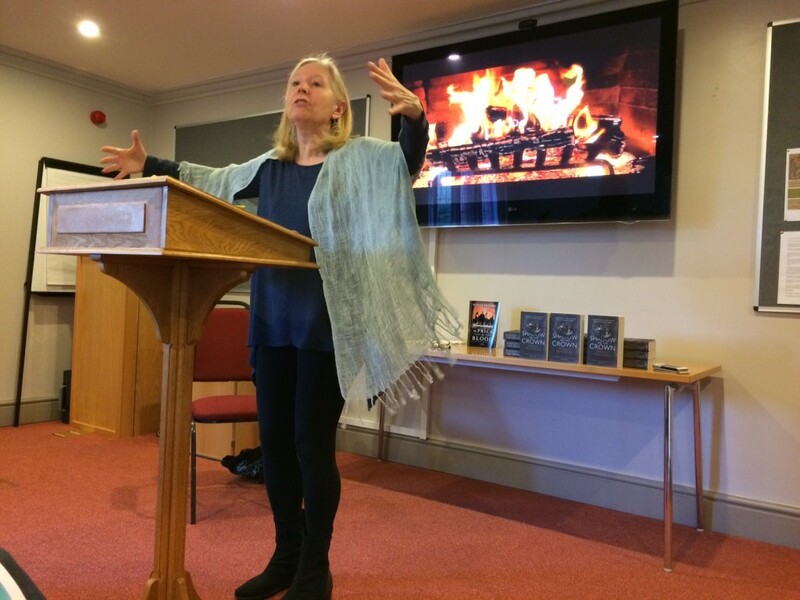 On November 1-2 the autumn Hearth Festival was held here, and I was one of four authors who presented talks or workshops and who participated in two question-and-answer sessions. Authors and attendees – writers all – mixed and mingled, dining together and sharing their back-stories and their hopes, seeking and offering encouragement. It is what writers do here in those in-between moments when they aren’t writing or poring over books. Recently a friend of mine saw one of my photos of this library and wanted to know where it was. “It’s gorgeous,” he wrote. I agree. 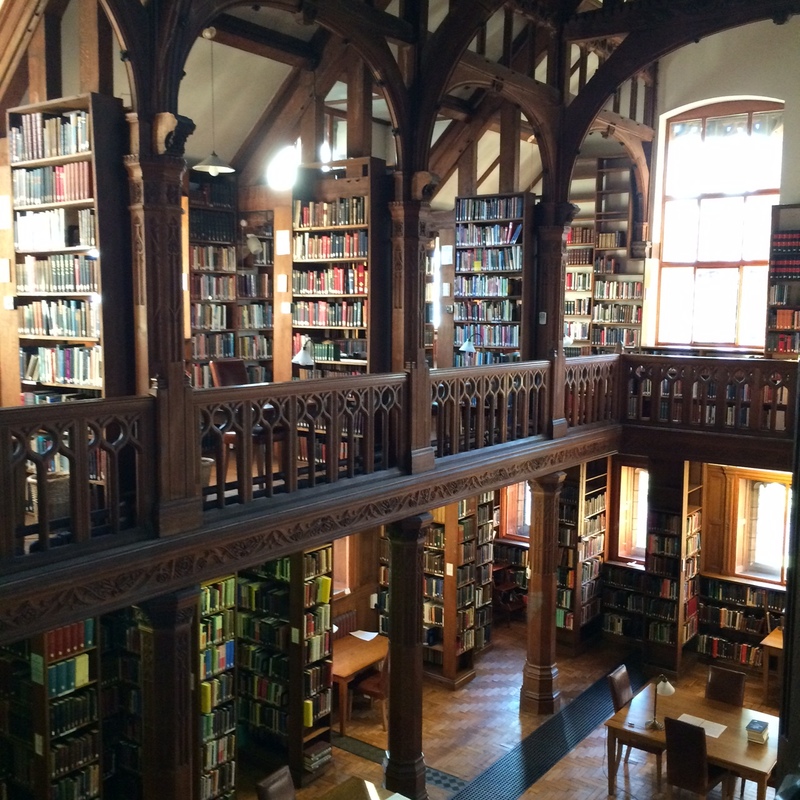 Gladstone’s Library is a beautiful place, but it is more than that. 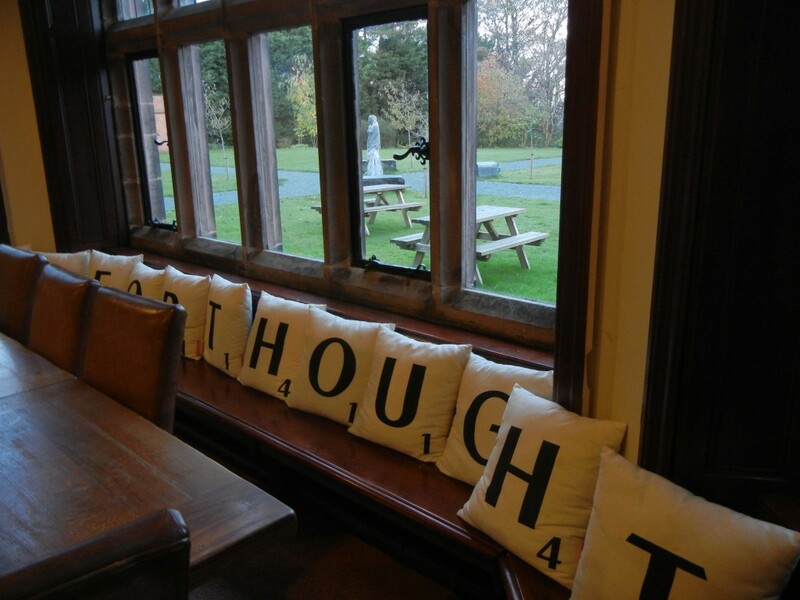 It is a retreat from the world and a gathering place, it is a feast for the mind as well as the eye. I am enormously grateful for the opportunity to savor it for these two remarkable weeks. 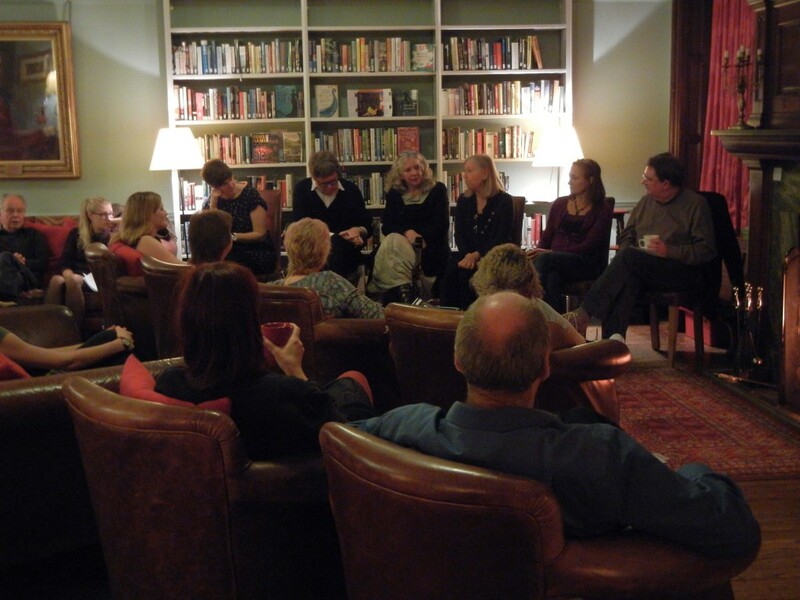 Gathering beside the hearth at Gladstone’s Library. This entry was posted in Books, Events, Research, UK, Wales. Bookmark the permalink. It was a real pleasure to meet you at Hearth and have the opportunity to swap some ideas during the discussions. On the final photograph, showing the panel together by the fire, my friend Cathy and I were seated in the middle of the front row. Although only the backs of our heads are visible, I’d very much like to incorporate that shot into my own account of the weekend’s proceedings. Would that be possible, do you think? It would be very much appreciated. Maggie – So glad that you enjoyed the weekend enough to want to write about it! Sending you the photo. Pure delight. If it’s not every writer’s dream, it’s certainly mine! Thank you for sharing your experience. Thank you for sharing your experience @ Gladstone and for the pictures! Stunners!